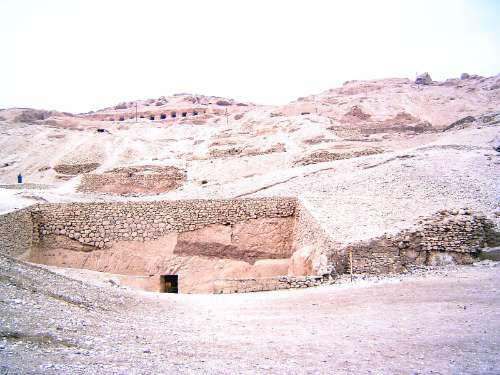 The tomb was found in 1831 but not cleared until 1889. 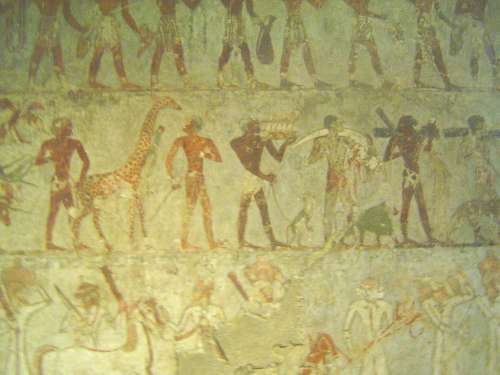 Inside, there's a famous mural showing the precious or curious objects retrieved during the expedition to Punt, modern Eritrea. 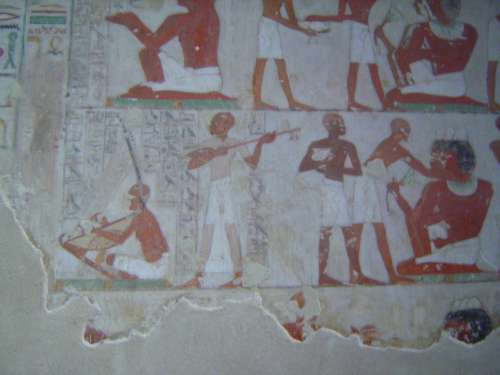 At the bottom, white-skinned men in white clothes. Presumably they are northerners. No matter. The text declares, "Every land is subject to his majesty." 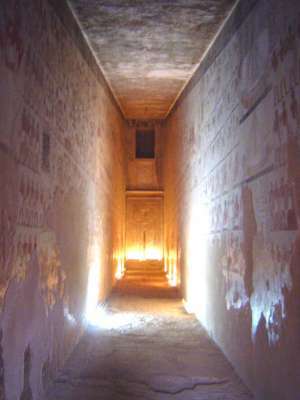 Beyond the initial room, this corridor extends 82 feet into the hillside, and the ceiling rises from 10 feet to over 26 feet high at its far end. Plenty of wall surface to paint. Many industries are shown on the left wall. 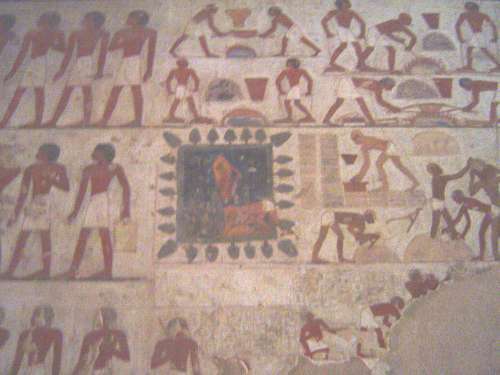 Here, in the center, two men fill jars from a pond. To the right, a worker mixes the water with earth to make mud, carried in baskets on the right. The finished brick is used to build a wall. Higher on the same wall, there's a portrayal of the storerooms of the Temple of Amun at Karnak. 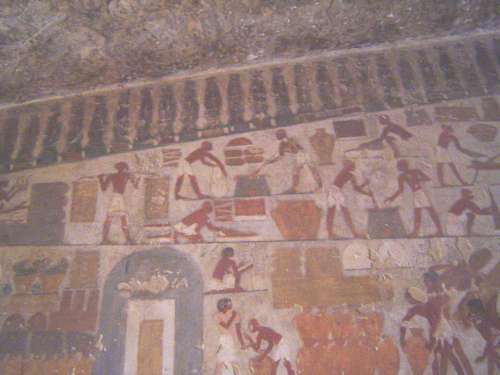 At the lower left, goods are piled before the storeroom entrances. 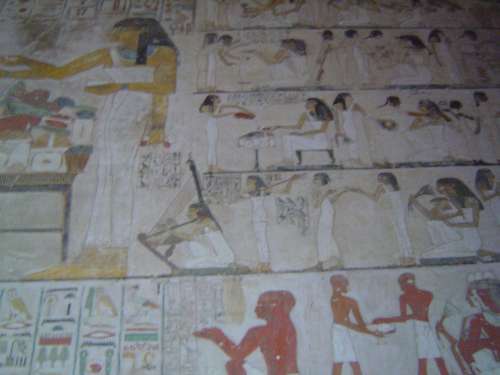 On the right, vases are being sealed and carried. The topics on the opposite wall are more personal. 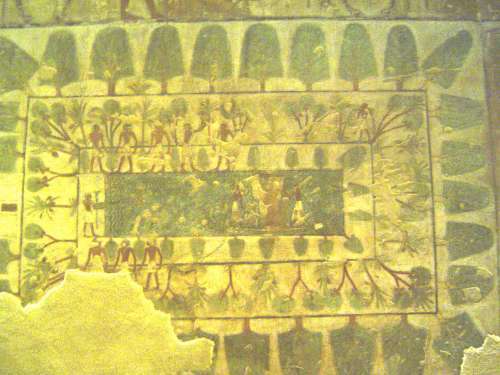 There's another pond, with a gardener at the upper right who is watering the trees; at left, a priest wafts incense. Rekmire himself is towed across the pond. Rekmire's funeral banquet. The sexes are segregated. The women's funeral banquet. A servant pours wine for a lady and returns the empty cup to the black slave behind her.